Former Brazilian President Luiz Inácio Lula da Silva, imprisoned for more than a year for alleged acts of corruption, is today the most important political prisoner in the world. 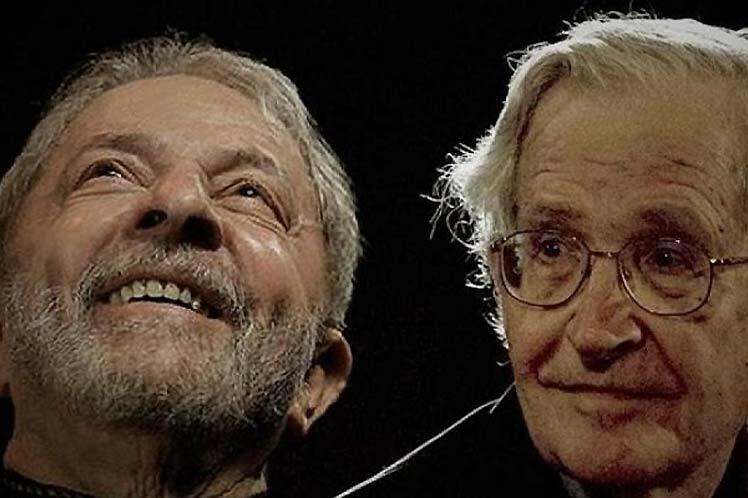 This was stated by the prominent intellectual and political activist Noam Chomsky, during an interview with the channel Democracy Now, amplified by the portal Rede Brasil Atual. According to the professor of linguistics at the Massachusetts Institute of Technology (MIT), the political prison seeks to silence Lula who, when he presided over Brazil, was the voice of the ‘global South’. Chomsky placed the prison of the former Brazilian ruler in a universal context and compared his situation with that of Australian journalist Julian Assange, creator of WikiLeaks, arrested on Thursday. The renowned American linguist, of 90 years, perceives, from the historical perspective, the imprisonment of both as similar to that of the founder and general secretary of the Italian Communist Party, Antonio Gramsci (1891-1937). ‘Some may remember when the (fascist) government of (Benito) Mussolini placed Antonio Gramsci in jail. The prosecutor said: We have to silence that voice for 20 years. We can not let him talk. That’s Assange. That is Lula. That is a scandal, “said Chomsky. He asked himself: ‘Do you hear something in the press about that? And he replied: ‘Well, Assange is a similar case: We have to silence that voice’. According to the renowned intellectual, under the Lula government, at the beginning of this millennium, Brazil was one of the most, perhaps the most respected country in the world. “He was the voice of the global South under the leadership of Lula da Silva,” he stressed. In September, the North American thinker visited the exmandatario in the seat of the Superintendence of the Federal Police of Curitiba, capital of the southern state of Paraná, and when leaving he thought that by right Lula should be next president of Brazil and that meeting him again was ‘a wonderful experience’. “It is not possible to meet an extraordinary figure of the 21st century every day,” he said on the occasion. Since April 7, 2018 Lula remains in prison in Curitiba after receiving a penalty of 12 years and one month imposed by the Federal Regional Court of the fourth region (TRF-4) for alleged acts of corruption. The former president was subjected in February to a second conviction in the anti-corruption operation Lava Jato, this time to 12 years and 11 months. During the last few months, some unprecedented events in the medical collaboration that Cuba has given, have happened one after another, which without the slightest interest in “thinking badly”, I do interpret that behind them can go the hairy hand of those who have always tried to discredit the human task, to bring life, hope and light, where others are present with missiles, bombs and military forces in the name of vaunted “Humanitarian Aid”. First, once he assumed power in Brazil the neofascist Jair Bolsonaro, discontinues the More Doctors Humanitarian Program, thus putting the Cuban doctors out of the South American giant, but not before proffering as many slanders and lies as possible against the true professionalism of our doctors, while, at the same time, encouraging them to defect and assuring them employment. Jair Bolsonaro, who stated, among the many falsehoods, that the doctors were slaves of the Cuban government, assured employment to those who were willing to leave the mission and not return to Cuba. Those who decided to opt for his call and his promises, today are the same ones who the passing of the months have found them unemployed and drifting away from what they can find to pay for their livelihood. Second , just a few days ago, as a result of irregularities in the payment, by their country, to the Congolese scholars who are studying at the Latin American School of Medicine, ELAM, these students created a climate of violence and instability in the center. It transcended borders, where the intervention of public order personnel was necessary in order to control indiscipline. A few hours after the events, the future health professionals apologized to Cuba, for such a situation …, but notwithstanding that it is a problem that concerns the Congolese authorities and not the Cuban ones, an unusual event occurred and before the eyes of the malicious, manipulators of information, criticism appeared blaming the largest of the Antilles and its study programs that train medical and paramedical personnel. 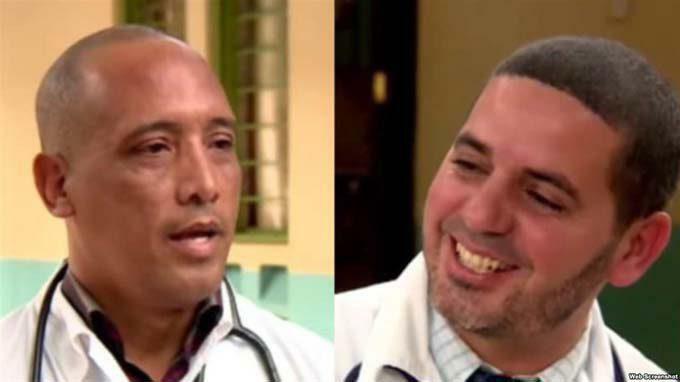 Third , and only a few hours ago, they kidnapped in Kenya two Cuban collaborators that make up the Medical Brigade, which since last year has been serving in that African land, an unprecedented fact throughout the long history of Cuba, in more than 160 countries of the world, where they have arrived with their message of health, life and hope for the needy. There are undoubtedly three significant facts, in different latitudes, but they could very well be marked by a single interest, although apparently they could not have contact points … and I do not want to “think badly”, but that interest and points of contact I see through the magnifying glass that guides my steps and my eyes towards those who, once and a thousand times, have tried to tarnish the human work carried out by the Cuban medicine world, and of course! They are the same people who, without scruples, have given themselves to the task of calling Cuban collaborators, like military men who arrive to indoctrinate the peoples. The Association of Caribbean States (ACS)—a multilateral organization that the Caribbean Community (CARICOM) conceptualized and helped bring into existence some 25 years ago – concluded its 8th Heads of Government Summit in Managua, Nicaragua on the 29th of March 2019, with the adoption of the historic “Declaration of Managua” and the confirmation of a visionary three year “Plan of Action”. The twenty-five Member States of the ACS – fourteen CARICOM nations, along with Cuba, Dominican Republic, Venezuela, Colombia, Mexico, Costa Rica, El Salvador, Guatemala, Honduras, Nicaragua and Panama – sent the World a most remarkable message of hope and commitment to human solidarity with their “Declaration of Managua” affirmations on such critical issues as climate change, respect for the fundamental principles of International Law, the maintenance of the Greater Caribbean as a “Zone of Peace”, and the payment of Reparations for the crimes of native genocide and African enslavement. It is note-worthy that the delegation heads of such countries as Cuba (President Miguel Diaz-Canel), Nicaragua (President Daniel Ortega), El Salvador (President Salvador Sanchez Ceren) and Venezuela (Vice-President Aristobulo Isturiz), as well as such CARICOM nations as Trinidad & Trinidad Tobago , Jamaica, Barbados, Grenada , Dominica, Antigua & Barbuda, Belize, St. Lucia , St. Vincent and the Grenadines, and Suriname were able to join together with the delegation heads of such “Lima Group” nations as Colombia,Costa Rica, Panama , Guatemala and Honduras to declare – at paragraph 22 of the Declaration of Managua—that they “reject the application of coercive unilateral measures that are contrary to international law, and that harm the peace and prosperity of the Greater Caribbean”. The adoption in Managua of the “2019-2021 Plan of Action” also reconfirmed the tremendous foresight manifested way back in 1992 by Sir Shridath Ramphal and his fellow Commissioners of the “West Indian Commission”, when they proposed that CARICOM take the initiative to establish a Caribbean Basin-wide “Association of Caribbean States” as a mechanism for a broader and more extensive “Greater Caribbean” circle of functional cooperation. The triennial Plan of Action is extremely wide-ranging, and it will now be left up to the Executive Board of the ACS’ Ministerial Council, under the Chairmanship of Barbados, to confer with ACS Secretary General Dr. June Soomer, and other officers of the ACS Secretariat located in Trinidad & Tobago, to establish priority projects and implementation modalities. The ACS will be celebrating its 25th anniversary on the 24th of July 2019, and, in his remarks to the assembled Heads of Government at the Summit, the incoming Chairman of the governing Ministerial Council, Dr. the Hon. Jerome Walcott of Barbados, urged all ACS Member States and Associated Member States to undertake celebrations of the “silver anniversary” that are thoughtfully designed to forcefully bring the existence and achievements of the ACS to the attention and consciousness of the masses of people throughout our region of the Greater Caribbean.